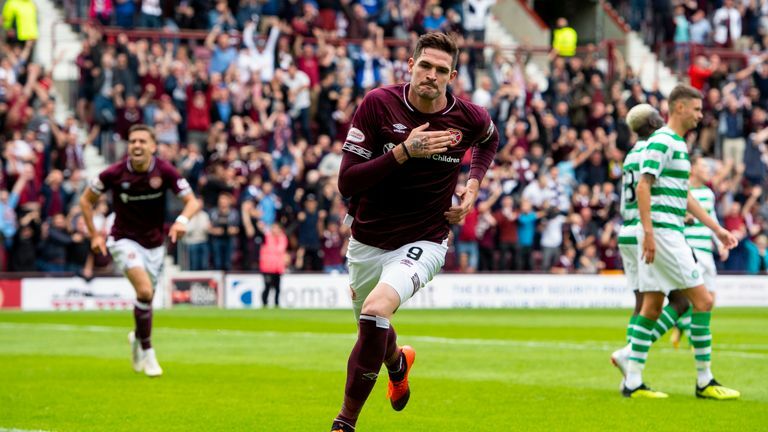 Rangers have confirmed the signing of Kyle Lafferty from Hearts on a two-year deal for an undisclosed fee. Sky Sports News reported on Wednesday morning that the 30-year-old was undergoing a medical and both clubs have now confirmed that he has returned to Ibrox for a second spell. Lafferty is expected to be available for Rangers' Europa League first leg play-off tie against FC Ufa on Thursday. He previously played for Rangers from 2008 until 2012, making 138 appearances and scoring 38 goals. The Northern Ireland international, who has scored 20 goals in 67 appearances for his country, joined Hearts last summer after spells at Sion, Palermo and Norwich City. He scored 19 goals last season for Craig Levein's side. Hearts owner and chairwoman Ann Budge told the club's website: "It is no secret that this has been a particularly difficult and drawn-out affair. "While we have no desire to sell our players to other teams in the league, when a player has his mind fully set on moving, it is difficult to reach an alternative conclusion. "The deal, when completed, will suit all parties and, importantly, will allow Craig to focus his efforts on finalising potential deals to add to his playing squad - having brought in 13 players already this summer - and preparing the team for their Premiership match at Kilmarnock, where they will bid to go eight games unbeaten."